Our designers are a talented bunch and they seem to be passing on their talents to their children, as Amy, one of our senior designers, reports below. Last week I went to see Jake Saunders, the son of Helen, one of our designers, in his school production of Romeo and Juliet. I’ve never been to a school play before but I’m a huge fan of R+J so I jumped at the opportunity. It was staged by Harlington Upper School’s older pupils in their auditorium. Harlington is a very modern school in comparison to the Malory-Towers-like establishment I attended, and the auditorium was very impressive. We sat in the front stalls looking down on the black stage and waited for the lights to dim. I could tell from the first scene this play was going to be a bit different. The actors were wearing their own clothes – the Montagues with a splash of blue and the Capulets with a splash of red. Although they were speaking in the Shakespearean tongue, the music was modern and so was the adaptation. Many of the actors delivered their lines well but only a couple stood out as incredibly natural talents and Jake was one of them, he played Romeo, and from the minute he spoke his first line it was clear he has a special gift. It was like watching a normal, polite young teenager going about his life – actors like him take all of the effort out of watching Shakespeare! I felt so proud for Helen. My favourite scene was the party where Romeo and Juliet meet. It was a fantastically abstract slow-motion dance with a dubstep backing track; someone drumming backstage and the cast’s stomps beefed up the beats and the creativity of the direction was really quite moving. Had I not had plans the next night I’d have gone again, I hope Jake’s in next year’s play – I can’t wait! 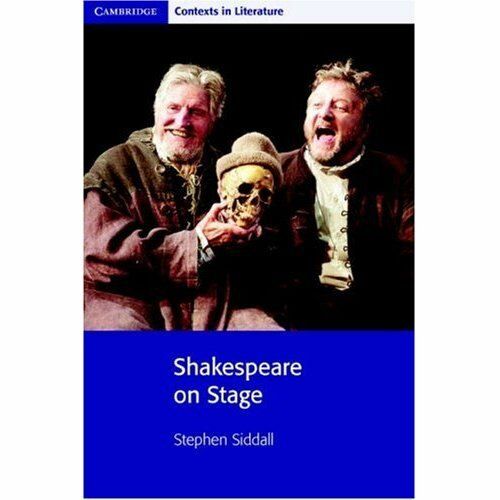 For more about Shakespeare, you could try Shakespeare on Stage (Cambridge Contexts in Literature) one of the books we helped designed.